Bridges are a replacement tooth used when there is no tooth or root remaining; they are able to be used if the neighboring teeth are still in place. They then “bridge” the gap between the two existing teeth. Bridges are used to prevent the other teeth from moving which can lead to further complications such as a bad bite. They also protect the gums from damage and decay where the missing tooth would have been. A bridge is needed if a tooth is to be removed completely, and the surrounding teeth are able to stay. 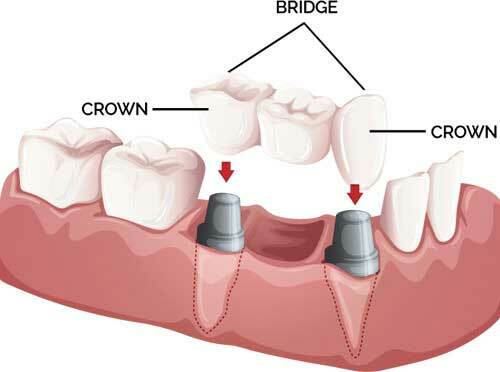 A crown is a cap on a remaining damaged tooth, a bridge is used to fill a gap where there is no remaining tooth.